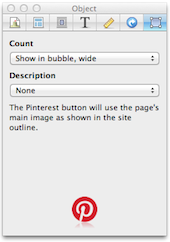 The Pinterest "Pin It" button allows your visitors to add an image from your web page to their Pinterest boards. It uses the page's main image as shown in the Site Navigator. You can change the main image by following the steps detailed in this help article. When your visitors click on a Pinterest button, Pinterest will launch a window where your visitors can modify and confirm the Pin. If they're not signed in, they will be asked to enter their credentials or sign up for a Pinterest account. You can insert this button by selecting "Pinterest" from the Sharing Bar subcategory in the Objects toolbar. You can then customize your Pinterest button in the Object Inspector. The bubble is shown at the top of the button. Pinterest will use the first 500 words from your page's main content area.